The time to fight back — and fight forward — for reproductive justice is fast approaching. The stakes are high in this year’s state election, with candidates for governor, secretary of state, attorney general, and other races on the ballot. The Arizona primary election will be held August 28, 2018, and voters need to be registered by July 30 to cast their ballots. Reproductive health has been under attack, both nationally and statewide, but Planned Parenthood Advocates of Arizona has endorsed candidates who put our health and our rights first. Get to know them now in our series of “Meet Our Candidates” interviews, and make your voice heard in 2018! Just weeks before he announced his candidacy for state representative late last year, Gilbert Romero was hitting the pavement for another campaign — the nationwide push for the Medicare for All Act. 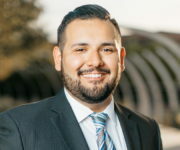 Although he’s only in his mid-20s, Romero has ample experience as a canvasser and community organizer in the Phoenix metro area. In addition to Medicare expansion, he has been an advocate and activist for the rights of working families and immigrant communities. Romero also brings “deep Arizona roots” to his candidacy, as he puts it on his campaign website. His family has been in Phoenix’s West Valley for generations — and, lately, that’s where he’s been going door to door to talk to community members. Romero seeks to represent Legislative District 21, which includes the West Valley communities of Peoria, Surprise, El Mirage, Sun City, and Youngtown. A recent incident in the first of those cities puts in sharp focus the need for candidates like Romero, who is also an ardent supporter of reproductive rights. Peoria made national headlines last month when a pharmacist there refused to fill a prescription for local first-grade teacher Nicole Arteaga. Arteaga had gone to the pharmacy after learning from her physician that her pregnancy would end in miscarriage, as the fetus she was carrying had no heartbeat. The pharmacist, though, cited ethical objections to providing medications that would safely end her pregnancy. He was protected by a 2012 “right to refuse” law that Democratic state legislators have been trying to repeal since it passed. When it comes to reproductive rights, Romero doesn’t mince words. As he wrote on social media earlier this year, “Our campaign unapologetically supports a woman’s right to choose.” It was that commitment that earned Romero the endorsement of Planned Parenthood Advocates of Arizona (PPAA). Romero generously took the time to tell PPAA more about his background, positions, and campaign on July 8, 2018. Please tell us a little about your background. I’m a third-generation Arizonan who’s lived in my district for my whole life. I earned my bachelor’s degree in women and gender studies in 2015 and then worked as a community organizer with Living United for Change in Arizona (LUCHA) working on the Fight for $15 campaign, fighting for workers’ rights. I’ve also been arrested fighting for the immigrant community.